Symbol of fertility, life and rebirth, the egg is associated with spring since ancient times before becoming the symbol of the resurrection of Christ. It also marks the end of the privations imposed by Lent. It was not until the thirteenth century that the first eggs were painted in Europe. As for bells, rabbits and other chickens, their symbolism changes from country to country. In France and Belgium, the bells ‘return’ at Easter to give children eggs that are planted on the road. German tradition has it that it is an invisible white rabbit that hides the eggs. In the United States and in Alsace, it is a hare; a stork in Thuringia: a fox in Westphalia or a cuckoo in Switzerland. 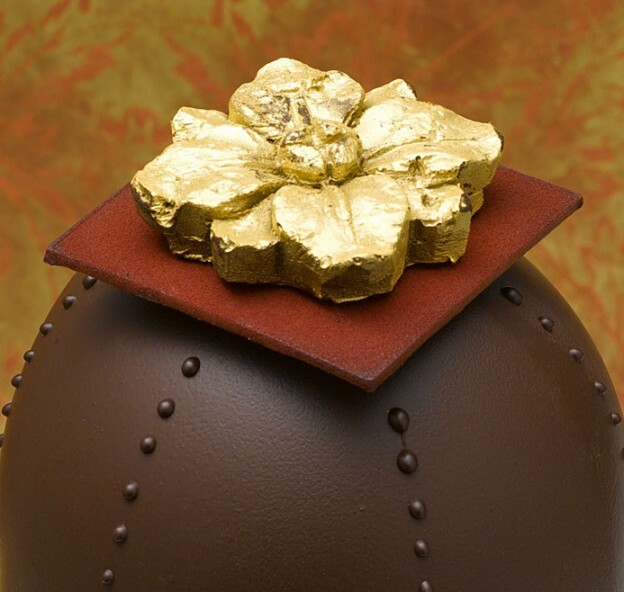 For years now, pastry chefs and chocolatiers have pulled together every ounce of their creativity to reinvent the traditional products that roll out with Easter – eggs, chickens and all manner of chocolate treats. Now, Easter creations have turned into true works of art that are at once modern and poetic, as well as playful and surprising. Here we take a look at this year’s offerings. Pierre Hermé is paying homage to Swiss artist Beat Zoderer, using his work as inspiration to create a truly exceptional Easter egg. It reflects the fascinating simplicity of Zoderer’s sculptures, as well as being an exercise in styling chocolate. 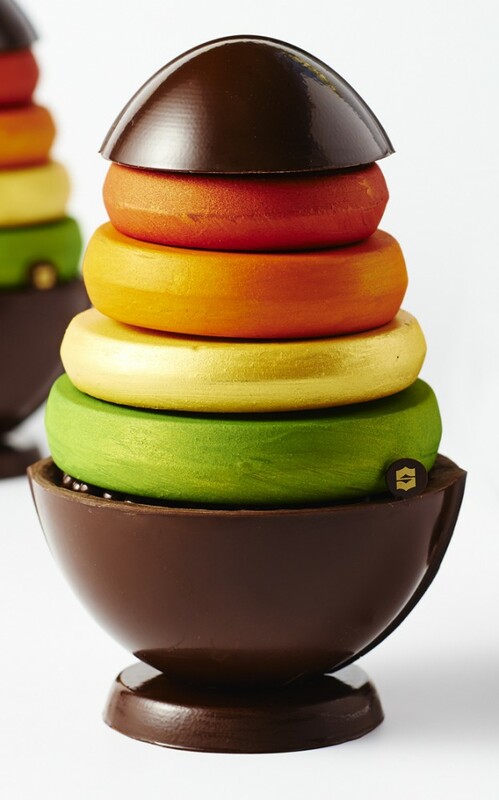 Bands of multicolored chocolate intertwine weightlessly over a voluptuous egg shell made from pure dark chocolate, originating from the Paineiras plantains of Brazil. Its notes of citrus, red fruits and spice are supported by powerful cocoa aromas. Under the chocolate base, a secret drawer also hides some extra treasures. 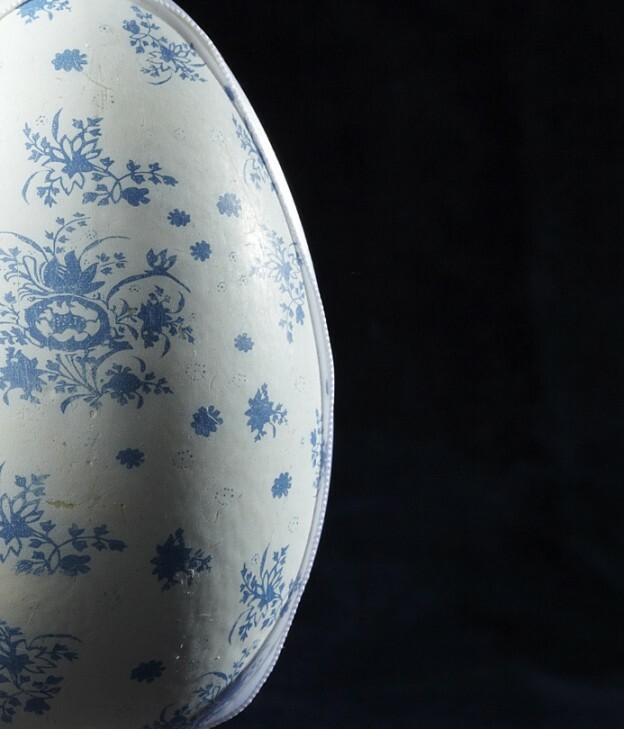 This year, the head of creation at Lenôtre, Guy Krenzer is proposing a dubious game: to give the traditional Easter egg a porcelain appearance. Here, the savoir-faire of chocolatiers and potters comes together to give birth to a piece inspired by the famous blue pottery from Delft and the patterns of Chinese porcelain. A piece of pure delicacy for precious gourmets. François Perret, the pastry chef at the Shangri-La Paris, has clearly kept his inner child alive. 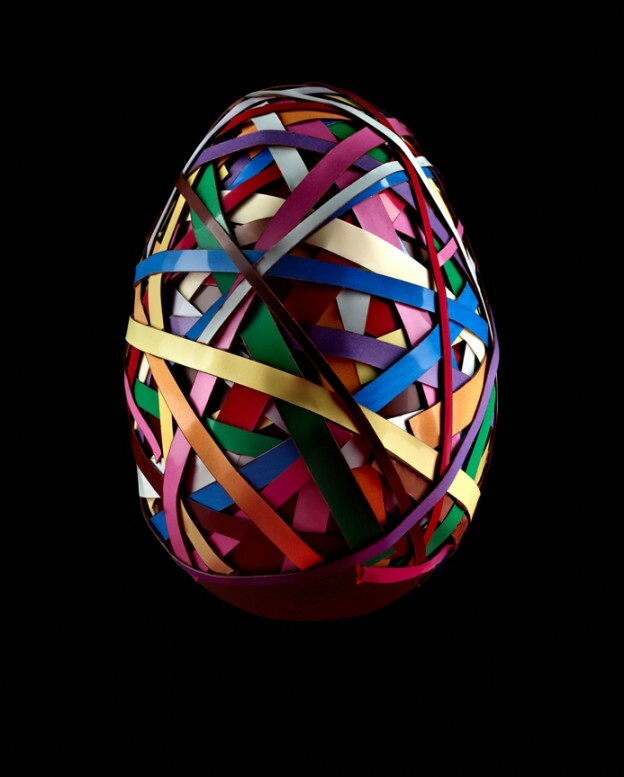 At least that is what one might expect once they uncover his Easter creation: rings that can be stacked up like building blocks to recreate a multi-colored egg or deconstructed so that each person can come up with their own creation. Made from chocolate with a high cocoa content, it will delight lovers of dark chocolate who may be reluctant to destroy this game that reminds them of their childhood. 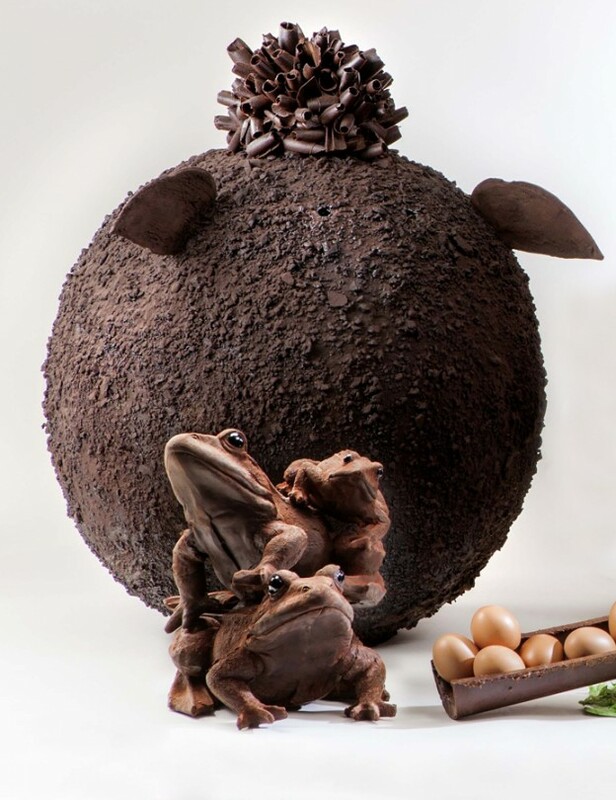 Like every year, Julien Merceron has come up with a particularly original creation for Easter. This year’s “egg head” is not an insult, but rather a reminder of some work by the Belgian artist René Magritte. A well made shiny chocolate head resting on a chocolate covered body, dressed to the nines. Perfect for artsy chocolate-lovers, nearly 400 grams of chocolate was used in the making of this creation. 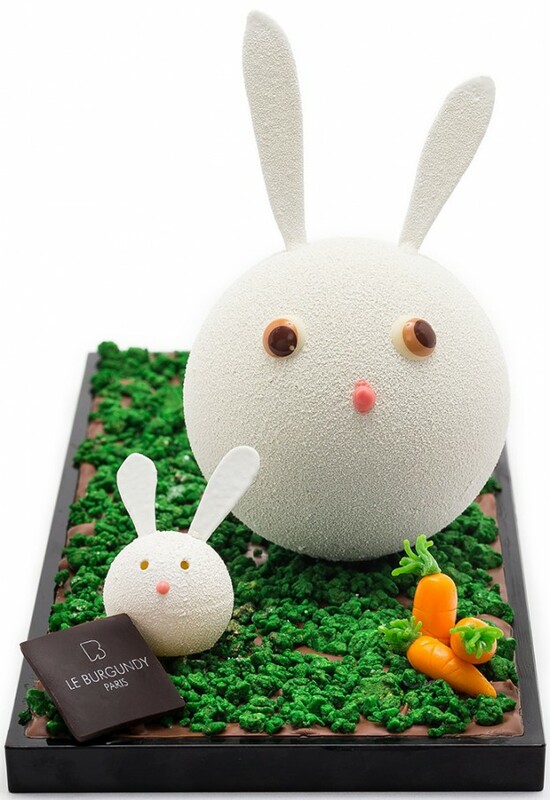 Stéphane Tranchet, the pastry chef at Le Burgundy Paris, has brought a touch of freshness to this Easter by creating a Rabbit Family in a vegetable patch. A very kawai gourmet creation made entirely of chocolate, a fluffy Mommy rabbit filled with crunchy pearls sits atop a green bar of milk chocolate with her little white chocolate, praline-filled baby bunnies. It’s a little countryside creation for everyone to nibble on. For this Easter season, Christophe Michalak is offering us a very rock’n roll vision of Easter. 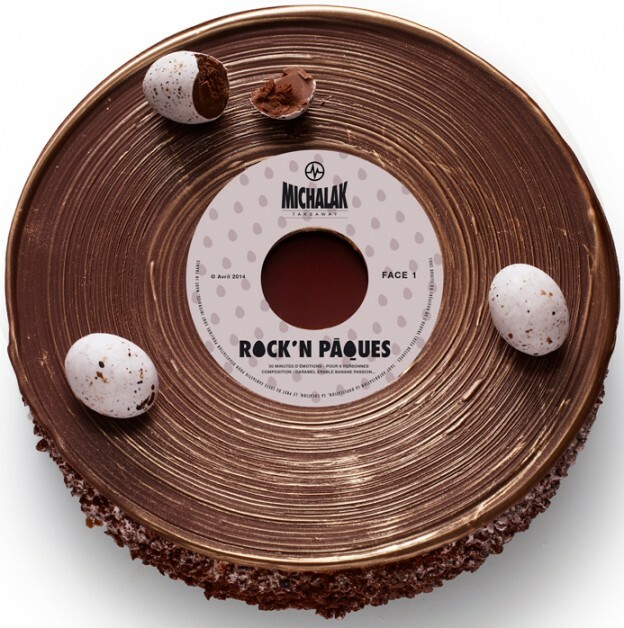 Whether in the form of a vinyl record (actually a cake soaked in maple syrup that dances with bananas roasted in passion fruit juice, all coated with a salted caramel butter) or an egg also topped with a disc, Michalak has put together a 100% chocolate gourmet playlist. One of the most important holidays in the Orthodox Christian calendar, Easter is a time for families to perpetuate traditions. 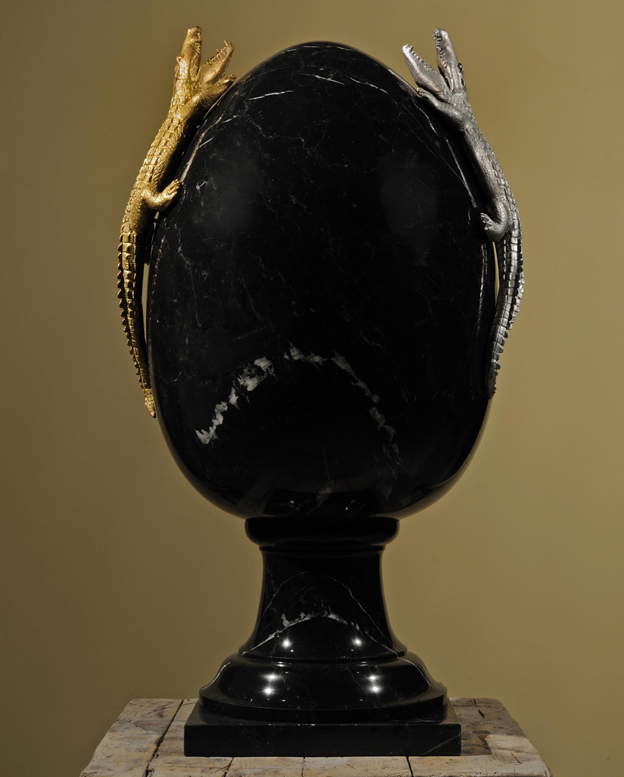 Damien Piscioneri, the resident pastry chef at Cafe Pushkin, reinvents this enchanted world with an Hermitage Egg whose gilded decorations recall the Museum of St. Petersburg, the luxury creations of Fabergé and the splendor of the imperial court. An idealized vision of a Russian Easter. 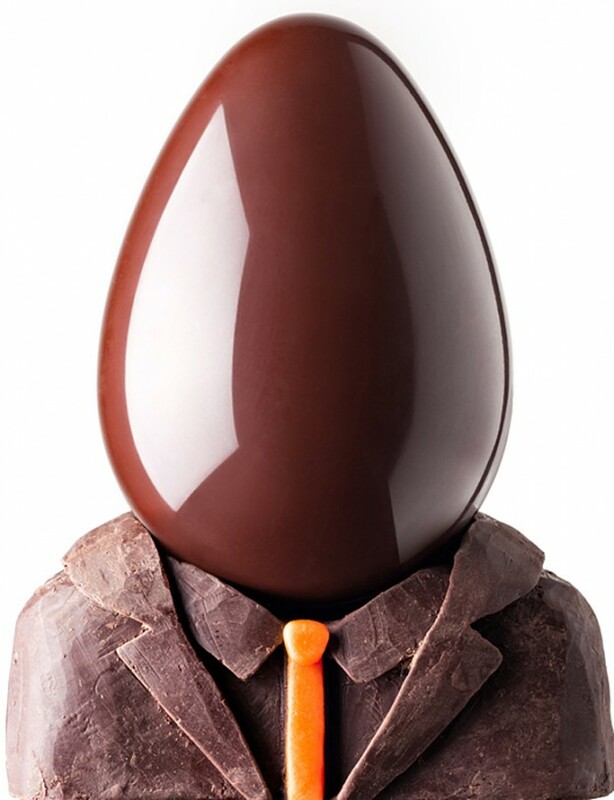 Patrick Roger is known for his monumental cocoa sculptures that decorate his boutiques and his atelier in Paris. His creations are so ultra-realistic that passersby could easily mistake them as real. For this Easter, he has imagined a bestiary fantasy which combines chickens, pig, sheep and some truly amazing toads. Made with striking realism, they appear to have come straight out of a wet meadow to be hand-sculpted by one of the great masters of cocoa. A sight to behold! 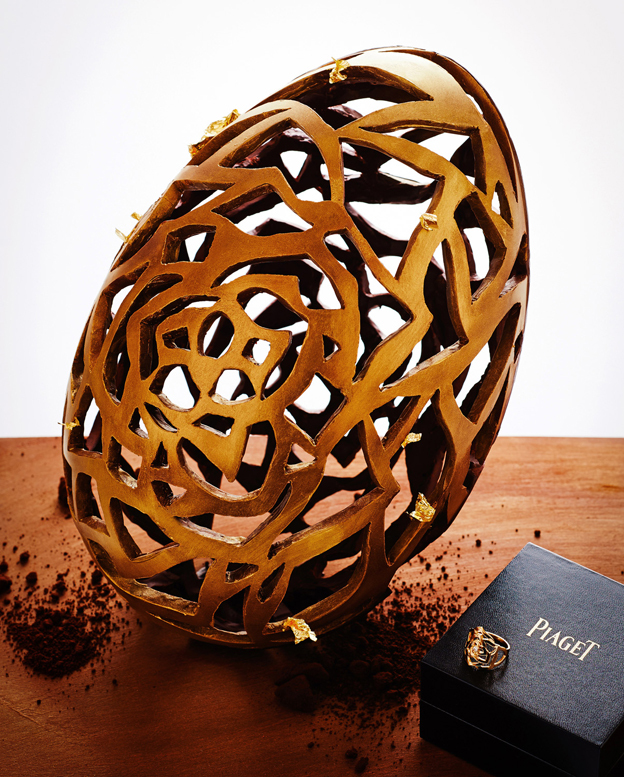 Le Bristol, crowned “Best luxury family hotel” was inspired by Piaget Rose collection to design a magic egg. Inside the unique creation by Laurent Jeannin, the hotel’s resident pastry chef, sculpted and perforated, hides a beautiful ring by the jeweler. What a delight for the mother of the child who finds that egg hidden in the French garden of Le Bristol during the egg hunt held on Easter Sunday. Ira von Fürstenberg has organised the largest egg hunt in the world. After the success of her “Objets unique” exhibition at the Bagatti Valsecchi Museum in Rome and at the Musée Jacquemart-André in Paris, the designer will participate in “Big Egg Hunt.” Nearly 300 eggs customized by leading artists and designers of international renown, as well as architects, fashion designers, street artists, chocolatiers…are going to be scattered in public places across the five boroughs of the city, along a marked route. Organised and sponsored by Fabergé, this prestigious event donates all the funds raised from generous benefactors (including Ira von Fürstenberg) to disadvantaged children and to the preservation of Asian elephants, whose existence is under threat. 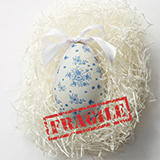 The eggs will be put to auction at Sotheby’s on April 22.